I think it’s safe to say that the original Anchorman is a firm favourite amongst fans of Will Ferrell’s work. That film attained a wonderful level of madcap hilariousness whilst escaping a lot of the excesses present in his other films. Anchorman 2 picks up some years later at a crucial juncture in the history of TV news: the birth of the 24 hour news network. No one thinks it can work, but Burgundy himself is handpicked to have a role in this new-fangled and ever-present novelty. Along the way, he’ll inadvertently change the face of news altogether, whether by design or by accident. Adam McKay’s film starts out strong. Whilst it doesn’t hit every comedic beat satisfactorily, there are enough side-splitting moments in the first half of the film to keep you entertained. Ferrell does a pretty good job, although it does feel like he’s simply impersonating his character from the first film. I can’t precisely put my finger on the cause of this, but his performance isn’t as immediate this time around. Luckily there are a bunch of other great actors around him. 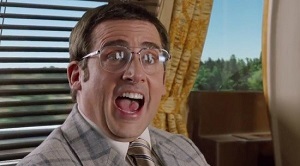 Steve Carell consistently steals the show as Brick Tamland. Every single line out of his mouth is perfect, and I really couldn’t get enough of his own type of insanity. Paul Rudd (Brian Fantana) and David Koechner (Champ Kind) are pretty good also, but none get the best lines. Dylan Baker puts in a great performance as Freddie Shapp, however he’s effectively playing the straight guy to Ferrell et al’s zaniness, so it can’t have been as fun for him. The problem is that the film loses steam half an hour before the end. Rather than focus on the broadcast news plotline (which turns out to be a kind of prequel to HBO’s ‘The Newsroom’, believe it or not) the film gets bogged down with Burgundy’s personal life. I would have much preferred the development of James Marsden’s Jack Lime, who early on seemed set to become the main antagonist. Instead, the film sails into mediocrity, hitting very few funny moments during the final act. If the second half of this film were as good as the first, Anchorman 2 would have been at least close to matching the success of the original. As it stands now, however, it feels like a 90 minute film padded out to 119 minutes.